This novel tells the story of Lizzy, taking little steps into her new life. She is slowly leaving her boring village behind, by being cheeky yet clever at her lessons, and getting a job in an office in the nearest proper town- and by saving to buy, and teaching herself to ride, a bicycle. All of that is watched over by her mother who expects her to do the housework for the men and her brother in the family. At the office, however, further steps are suggested to her- shorthand and typing classes, but she discovers something new. Lizzy discovers W. S. P. U (the suffragette society) becoming a fully committed suffragette. Thus unlocking new purposes for her. Throughout this novel, themes such as strength, courage and determination are shown. Lizzy (the main character) may be seen as a role model to girls from an age range of 8+ as she shows the power of fighting for what is right. She shows mental strength which could benefit many girls in this day in age. Therefore I recommend this book to younger teenagers as it is quite a mature topic although the book is very physically readable. Even though it is written for teenagers, I think an adult could read it too and it's suitable for anyone- any reader with a head open to learning and absorbing new information about real world problems. As well as this, you are still learning facts through made up yet relatable characters. I like that even though this book was set 100 years ago, it is still very relevant to society today and the situation the world is in now, for example, the power of protest, which makes it interesting. There are also many things we can learn from this, not only regarding messages the author portrays but also factual information, mainly about the Suffragettes. For example, I learnt about the'Cat and Mouse Act' which entailed the prisoners to gain health again from their hunger strike only to be arrested again once healthy. Watching Lizzy develop into a strong woman was fascinating. Reading about her whole experience in depth made me feel like I was there; it really motivated me and made me look at things from a different perspective. I highly rate this inspiring novel written by the author Linda Newbery. 'Until we win' is a great historical fiction book. It is about when women hadn't got the vote. Lizzy is the main character. She meets some suffragettes and it is from that point on she becomes a suffragette. She spend months in prison suffering from being force fed and she is released because of the Great War. This book is suitable for ages 12 plus as it is not a long nor a hard book. This book is based on real events and is historically accurate. It sends out a fundamental message to younger readers about the importance of voting and standing up for your rights. It also shows a vital sign of what life was like a hundred years ago and how unequal life was between the genders. My favourite part of the book was the ending. 'And I fought too, in my small way. I was there. I'm proud of that'. These three sentences touch my heart and I can generally feel the emotion she went through. It showed her that she was part of a huge issue. Maybe without her help, we still might not have the vote! I would rate this book four out of five stars. I think this because it is a wonderful story and is extremely historically accurate. It also simplifies reading for younger kids or those that find reading difficult. It conveys the lack of women's rights. domestic abuse, unequal share of workfare and the hardship endured by suffragettes when arrested. Linda Newbery has done a great job of condensing a big issue into a small story. I quite liked the book especially how it educates you about the suffragettes and suffragist and women's votes but still maintains an interesting plot. My favourite parts were joining the war and finally getting the votes for women and also I liked the little reference to Emily Wilding Davison as I studied her before. I would have liked the book to be longer so it can develop the side characters more, so the read can connect with them more. I gave this book 3.5 stars out of 5 stars. I thoroughly enjoyed this book as it proved a clear message of women empowerment while keeping the balance of easy vocabulary, especially for people with dyslexia (I found this out after researching about the book). Not only can those with dyslexia read it, but also anyone who wants to pick up a quick read- mostly young adults/ children for a surprisingly short book for the amount of story it contains, it would make an excellent teaching tool to guide children through an important party of history. This book really spoke out to me because although the level of complexity is not difficult, it still shows the insightful lives of how it was like for women before World War I and finding job opportunities at the beginning of the war. Lizzy's first step to freedom and equality was getting her own bike. Then that led to her being able to travel wherever, where ultimately lead her down the path of joining the suffragettes alongside brave women like Emmeline Pankhurst. The cover is also very clever. In my opinion, some readers might want a thicker more detailed book especially for historical fiction. So they might not enjoy this book as much but for younger readers 12 plus this will be an entertaining book that is not too short or too long. They will understand that women's rights to voting is a privilege and many have devoted their lives for equality. 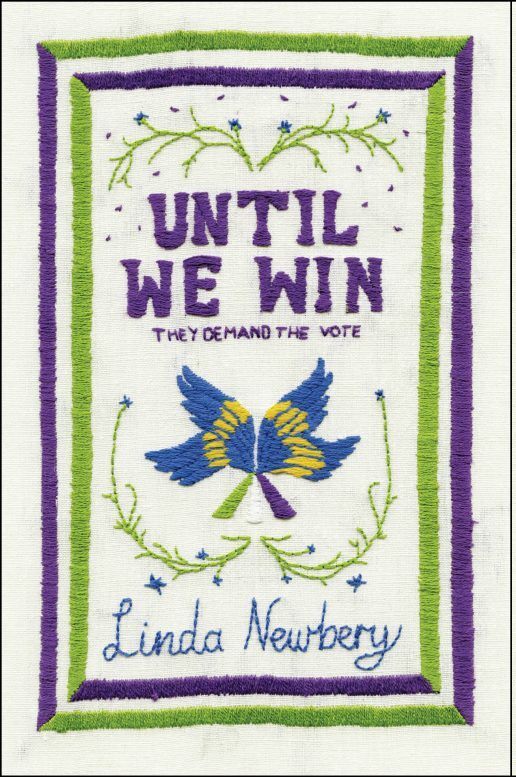 Until We Win is a motivational novel by Linda Newbery about the suffrage movement and how it inspired so many women. One girl journeys from being a quiet office clerk to standing up for womenâ€™s rights. From meeting important people to ending up in prison, this story explores many aspects of this crucial and engrossing chapter in history. This book has a strong theme of feminism. It is perfect for any budding female leaders with bravery and strength. My book is called 'Until We Win'.Â I chose to read this book at first because of the front cover, which caught my eye. But when I started to read the blurb about votes for women and equality I wanted to read more because it sounded interesting learning how men and women came to equality. This book was a page turner and very gripping. I liked the way that the women would have parades. I think this book was very good at telling the story about votes for women. Until we win is a very relevant book for 2018 because it is about women getting the vote. It is about a girl called Lizzy and in the summer of 1914 she is 17. There is a lot of history to this book. She is flattered that her boss thinks she is clever and it is because Mr Dawes gave her this job that he met two suffragettes called Julia and Elise. In the book she goes to WSPU meetings with them and becomes part of a new group. She hears about the extreme things that suffragettes did to get the vote including going on hunger strike. This book is also about someone who is growing up and thinks life is a bit unfair and wants to do her own thing, however he new friends show her that not all men are bad. I liked this book, it was quick and easy to read, it was fairly short and the writing was nice and clear. It also told me something about the boys when the First World War started as well. I thought the history in the book was quite realistic. I really enjoyed this reading book mainly because of how accurate this book was to history and the time of the suffragettes. Also it gave me a greater understanding of the suffragettes during the war and how they eventually won the vote. The book gave a good perspective on that time without sounding too much like a non-fiction book. The character's introduction to the suffragettes was quite unique and didn't just start with them joining straight away but instead a steady build-up. It shows that even some women didn't care too much for the suffragettes and their actions and instead dismiss them as 'silly girls'. Alternatively it also shows that it wasn't just the women fighting for the vote. I really like that the cover is designed in an embroidery pattern displaying the colours and the logo of the suffragettes and that inside the cover it shows the other side of embroidery patterns that no-one sees. This is a very good book and I strongly recommend reading it. I've always loved learning about the suffragettes. The things they went through to get the vote are remarkable. After reading this book I definably want to learn more about the suffragettes like what would the world be like fi women still couldn't vote. Overall I really enjoyed reading this book as it was informative but enjoyable. Although I would have liked to get more into the jobs women did during the war. I really enjoyed reading this book, my favourite part was the bit where Lizzie meets suffragettes Julia and Elsie and is really surprised that Julia has been in prison. It is nice that Lizzie had gone to Waltham to join shorthand evening classes but instead joined the suffragette meetings. This also shows that Lizzie is really committed as she keeps going to these meetings and it also shows her passion. The history in the book was exciting ; you learnt about how life was like when you had to travel by bicycle to get to places and to what extent these brave women went to just to be able to get the vote when many thought the vote was best to be with men. This book made me want to read more books by the author because I felt that this book was like a fictional snippet from history and I would like to hear more of these little historical stories for example maybe a book continuing on from the war and how it was like for people then as they must be terrified and worried about their friends and family. This book reminds me of another historical fiction book, 'Opal Plumstead' by Jacqueline Wilson, as Opal, as well of Lizzie was one of the youngest members of the suffragette society and was also lucky enough to hear the a speech from Emmeline Pankhurst, they both believed that women should get the vote but Opal wasn't as passionate about votes for women as Lizzie was. The cover of the book relates to the time of history it was set in, with the theme of sewing somewhat like a tapestry, it is colourful with the colours of suffragettes, purple for dignity, white for purity and green for hope : it was designed by Barrington Stoke and the cover image was done by Stewart Easton. This book gives an interesting insight into the life of a Suffragette. The book was set before the First World War and showed a detailed understanding of the Cat and Mouse Act and hunger strikes. Until we win is about this seventeen-year-old girl named Lizzy Frost who works at Palmer and Dawes. But she ends up becoming a suffragette after meeting Julia and Elsie. I love this book because It includes many different stories. I also like the style of writing the author uses because I find it hard to stay reading a book but when an author makes it shorter it is easier to read and includes much more information making you want to read faster. I found the suffragettes really inspiring because they went through so much just to allow woman to vote. They protested for what they thought was right even if they knew they would have to suffer the consequences. I also loved that they lived by 'Deeds not words'. I thought the story was very realistic and everything seemed to fit. I had previously done a homework on the Suffragettes at my old school and the writer actually uses the real life 1914 Suffragette leader Emmeline Pankhurst. This book was really interesting and was full of information and I would like to research more about the suffragettes in more depth.